Welcome to Haven House! 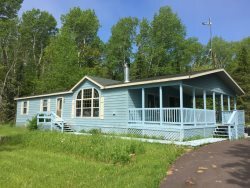 A comfortable 2 Bedroom and 2 Bathroom cabin located about one mile from downtown La Pointe on Madeline Island. The main bedroom has a queen bed and two twin beds; and the second bedroom has a queen bed. The home features a full kitchen and private deck overlooking the wooded area around the cabin. For those who need to stay connected while on vacation Haven House also has WiFi and Cable TV. Haven House can accommodate up to six guests. There is an additional charge of $25/per person above 4 guests.